I used Simply Natural Lip Balm and Repairing Body Balm to replace the typical petroleum health and beauty uses. And you know what? In all cases they worked just fine. I’d say better because the Nine Naturals products are not sticky, gloppy, and greasy like petroleum jelly. 1. Soften cracked, callused, or dry feet. I have ugly callused dancer feet. After several nights of applying Nine Naturals Repairing Body Balm to my calluses and wearing socks to bed to keep the balm on my feet and off the sheets, my rock hard calluses are softening for the first time in forever. Sorry, no photos. I don’t want to gross you out. 2. Keep your nail polish on your. Make nail polish mistakes easy to clean off your skin by applying a little on the skin around your. When your nails are dry, wash your hands. The nail polish mistakes wash right off your skin. 3. Remove a ring from a swollen finger. My ring finger swelled in the humidity. I ran a bit of Repairing Body Balm above the ring on my finger and it came off with a gentle pull. 4. Gloss your lips. 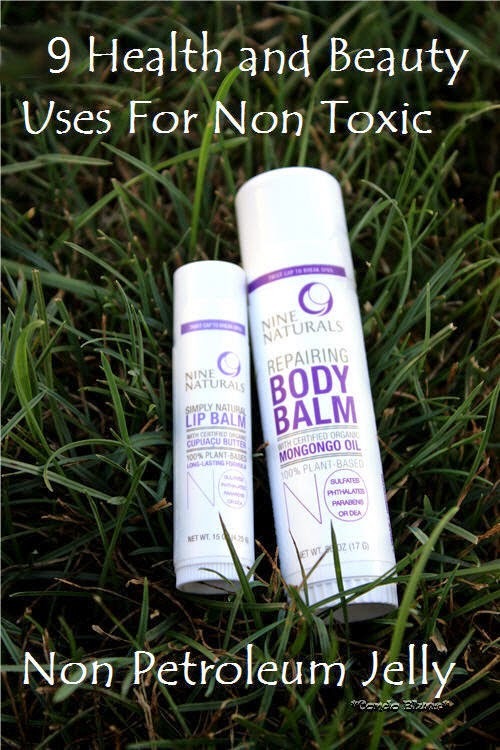 I’d use Repairing Body Balm in a pinch or if my lips were so dry they cracked but I prefer to use Nine Naturals Simply Natural Lip Balm every day so my lips don’t get to that state. I can’t use most natural and DIY lip balms because the honey in most of the recipes dries out my lips and makes the problem worse. Simply Natural Lip Balm doesn’t do that because it is vegan. It like all Nine Naturals products don’t contain sulfates, parabens, phthalates, petrochemicals, DEA, synthetic fragrances, or artificial preservatives. Yay! 5. To Wear Essential Oil as Perfume or lengthen the life of perfume. Some essential oils can make you break out if they are used directly on your skin. Instead of mixing it with a messy carrier oil, I dab a bit of balm on my skin and add my favorite scent. The scent will last longer too. 6. As a protective skin barrier. If I spent too much time in the water as a kid, I used to get giant itchy welts. After failing to find out what caused it my parents prevented it by covering my skin in a petroleum jelly to act as a barrier between my skin and the water. I tested using Repairing Body Balm instead and it works just as well. I feel a lot better about using it on my skin too. 7. Soften dry hands. Your hands are so dry that daily moisturizer doesn’t make a dent, use the same technique to soften your hands as you can your feet. Apply Repairing Body Balm to your hands before you go to bed (gloves optional) to soften your hands. 8. To protect or heal wind burned skin. My mother used to slather my face in petroleum jelly to protect it from the harsh winter winds whipping off Lake Erie. She also used it to heal windburns when I managed to escape the house without a petro face coating. Repairing Body Balm protects and heals my skin from windburn in the same way. The only difference is I don’t have to sneak out of the house to avoid nasty chemicals on my skin! 9. To protect your skin from henna and hair dye. Running a ring of Repairing Body Balm on your skin just under your hairline will stop hair dye and henna from accidently stain your skin. This can be a big, big deal if you are dying your hair bright red or blue! Disclaimer: Nine Naturals supplied samples to facilitate this post. This did not have any influence on my opinion because all opinions are 100% my own.